Preheat oven to 190°C/375°F/gas mark 5. Use buttered bread slices to line a 20.5cm/8ins tin, at least 4cm/1½ins deep. Avoiding any gaps. Brush the inside of the case with melted butter and chill whilst making the filling. Peel and slice the cooking apples. Cook with 2tbsp water for about 10 mins until soft and fluffy. Add the sugar and mincemeat. Pour into the flan case. 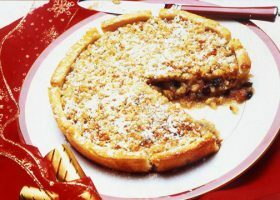 For the topping, combine the bread crumbs melted butter and demerara sugar and sprinkle over the apple mixture. Cook for about 35mins until crisp and golden. Serve with crème fraiche or custard.